Congratulations Jason Hess! You are the winner! Since I’ve been writing this blog over the past four years, I have posted 102 times. Maybe I should have put together this giveaway for post number 100, but the God’s Glory Alone post reflected why I’m writing this blog, not a promotional giveaway. Does hell exist? Are biblical references to it just metaphoric? And if it does exist, what are the implications for our everyday life? Bruce Wilkinson, the author of the bestselling book The Prayer of Jabez, presents a follow up to that book all about miracles. Jesus isn’t interested in having fans and fan clubs; He wants truly committed followers who will give everything for His sake. 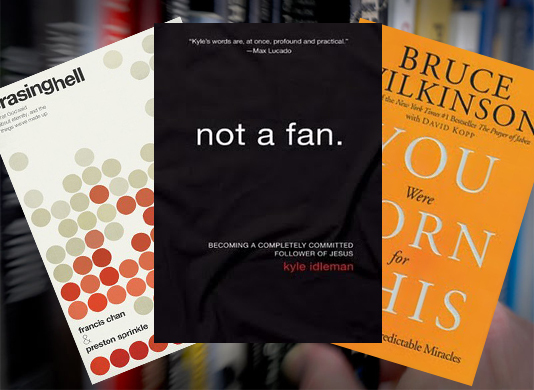 That’s the message of Kyle Idleman’s new book: Not a Fan. Thanks for the chance to participate in the giveaway! I'm looking forward to reading the books.